Location: Staten Island, NY & Cape Coral FL. Can anyone tell me the proper pinion angle for a 63 Riviera. Just finishing a 700r4 conversion and I ended up with a vibration between 15 and 25 mph. I'm running a 4" carrier Bering mount from a 64 or 65. When I run the carrier Bering mount from the 63 which is approximately 5 1/4" in height the vibration goes from 15 to 25 up to 45 to 55 mph. The shaft has all new universals, carrier Bering and has been balanced. Any direction would be greatly appreciated. Oh one last thing I had a one piece shaft made, also all new, vibrates from 65 on up to 100 and continues to vibrate even if I throw it in neutral. Smooth as could be at any other time. For a one piece driveline, the rules are simple. The joints must have angles, and the angles must be equal and opposite. What this means is that if the crankshaft is level, the rear axle pinion must also be level. If the crankshaft points down at 6 degrees, the pinion must point up at 6 degrees, and so on. The idea here is that the speed variations of one joint cancel the speed variations of the other joint. The yokes welded in the driveshaft tube must be aligned correctly with each other for this to happen. Some factory jobs (of various makes) put a little too much angle on the rear joint, the idea being that the angles are equal and opposite (and the driveline smoothest) under hard acceleration. Personally I think I would rather have the angles perfect at part throttle cruise. If the universal joints have no angle at all, there are no speed variations to cancel, but then they will fail right away. The needle bearings will pound little dents into their races. Joints that have plain bushings instead of needle bearings can run with no angle, but then they must be bathed in oil to survive. Old Buick and Chevrolet torque tubes with only one U-joint are an example. Trying to figure out how it should be for a two piece driveline makes my head hurt. Hopefully someone else in here knows how. The speed variations would still have to add up to zero. Thanks for the information. My head hurts. Please if anyone has ever done one of these conversions or knows anyone that has please ask them to respond to this post. I easily have $800.00 in this vibration problem and am nowhere. Search the forum for Tom T.'s comments on balancing 1st generation Riviera drive shafts. Its uncommon. Could be that when you had your driveshaft made, it wasn't assembled properly before being welded. Did they keep the Double Cardan CV joints in the shaft or is it just U-joints on the ends? No just the shaft. However the original shaft from the 63 for the Dynaflow doesn't have the CV joints either and that ran out ultra smooth. Tell me more. I'm sorry please don't mind me. I don't know what confuses me more posting on this site or trying to figure out the vibration. The one piece shaft runs through the frame without the carrier bearing. 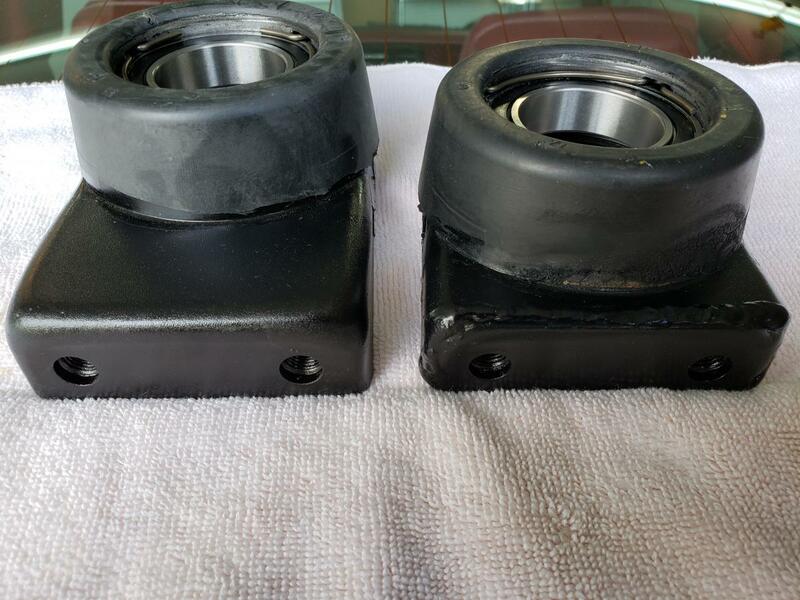 When I was speaking of the two piece shaft I was referring to both the 63 carrier bearing mount 5 1/4 inch height and the 64 and 65 at 4' height. with the 64 and 65 mount it vibrates between 15 and 25 and with the higher 63 mount the vibration moves up to 45 to 55 mph. I need direction! 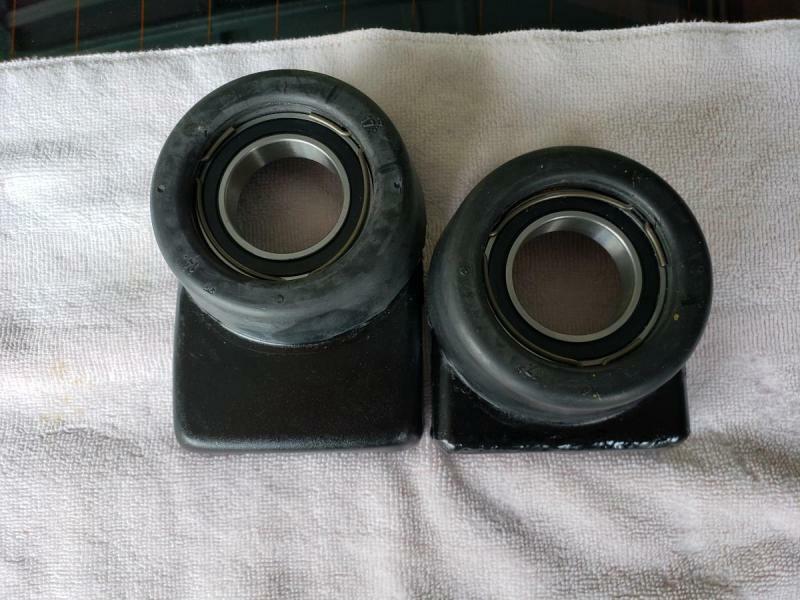 Here are pictures of the two carrier bearing the 63 is the tall one and the short one is a modified 63 to be the same shorter height as the 64 and 65, 4". How much difference in length between the old Dynaflow and the new transmission? A difference in length would change the angle of the front two joints, possibly causing the problem. If I remember correctly, 64 and 65 use a different transmission (400?) that is not a Dynaflow. The length of the transmission was probably different. That might have required the carrier bearing change. To instead run a single piece driveshaft with two conventional universal joints, the angles on the u joints must be equal and opposite with the car at normal ride height. It is likely that they are not since the original driveshaft was a different type. You may be able to fix it by changing the pinion angle. I think the upper link on the rear suspension is adjustable on a Riviera. With a solid driveshaft running THROUGH the center of the X frame, you cannot expect to have too much rear axle travel without the driveshaft hitting the frame. A one piece driveshaft will work in a ladder frame, but not a cruciform frame. I'm betting whoever reworked the driveshaft got it out of phase when he modified it to fit the transmission. As Ed suggested earlier, go back and read Tom T's posts about driveshaft phasing. The 63 was engineered out of phase for a reason and correcting it to be like a normal driveshaft will create vibrations. Consult the Chassis Manual. I believe these were designed to be 37 degrees out of phase and should stay that way. Good morning, Thank you for taking the time to answer my post. As an answer to your questions. The 700r4 is approximately 9" longer then the Dynaflow. The 64 and 65 have a carrier bearing that sits 1 1/4 inches lower then the 63. I really have no intention of running a one piece shaft. It's just one that I had made as an experiment to see if I could get rid of the vibration. The upper rear link is adjustable. I've tried many combinations between shimming the trans and rolling the rear. I'm so lost at this point it's driving me nuts. Forget how much I have into this at this point. Thanks for taking the time to answer me. I've been searching for the post as Ed instructed me to do. I can't seem to find it. I must be looking in the wrong place or I'm not using the site properly. Believe me I'm trying to find it. If Tom took the time to wright it I would really like to read it. Could you possibly provide me with some instruction about the proper way to track it down. I'm sure it's pretty simple if you know how. What exactly is Phase? Is that making sure that the ends of the shafts all line up? I have a complete shaft from a 65 Riviera Grand Sport with 2 CV joints on the rear shaft and it seems that with the front shaft straight up and down the other end of the rear shaft is at 1 O'clock. I have the original 63 Dyanaflow shaft that was originally in the car and has not been touched and does not vibrate at all. With that one, if the end of the front shaft is straight up and down then the other end of the rear shaft is at about 11 O'clock. Some people seem to think it matters and others seem to say as long as its all balanced together it shouldn't matter. The two piece shaft that I've been using is straight up and down. Ed thanks so much for getting back to me. The search feature on this forum used to work great. It is now worthless. Found the post from Tom T.
DON'T let them tell you its out of phase. They are supposed to be 67 1/2* out of phase from the factory. When you replace u-joints use the solid H/Duty ones. They are MUCH stronger. That's one of the reasons they were used from the factory. Thanks much for finding that post from Tom for me. It is greatly appreciated. I attached 2 picture of 3 driveshafts that I have. 1) The first rusted one with the 2 CV joints is from a 65. You can notice that with the front yoke at 9 and 3 the rear shaft looks like it's at about 1 O'clock. Also the front yoke of the rear shaft looks approx 90 deg out from the front shaft. 2) The middle shaft is the one I'm running with the vibration. As you can see it's quite a bit shorter then the other two approx 9" shorter. Now that I read the post from Tom I'm seeing a few problems. If you notice with the front yoke at 9 and 3 the rear shaft is exactly the same. Straight up and the Yoke on the rear shaft is not 90 deg off. Does it need to be 90 off? Or does that point not matter? Also the end of the rear shaft is straight up the same as the front of the front shaft. 3) The last shaft further to the right side of the picture. This is my original shaft from the Dyanflow. You can notice on this one that with the front yoke at 9 and 3 the rear yoke from the front shaft is at about 11 O'clock and so is the rear shaft. This shaft has no vibration at all regardless of the speed of the car. So what I take away is that neither of the two stock shafts are straight up. Both seem set off center but not the same. Why aren't they off center but the same. I guess that would be because there different years with different transmissions. So where does that put me? Do I set it as the 65 which has a 400 turbo which is about 1 O'clock or the dynaflow which is standard to the 63 and set at 11 O'clock? I think the 65 400 turbo is much close to the size of the 700r4 then the dynaflow, but I'm still lost. Any suggestions of which one I should try to mimic? Tom, Ed, anyone any thoughts? Please guy's don't give up on me yet. As has been described above when a ujoint goes through an arc one half of that ujoint speeds up and the other slows down. If this condition exists on one end of the dshaft and not the other, an extreme vibration will present itself. IF this phenomenon also happens at the other end of the dshaft at the same time and opposite in force the vibration will cancel out and the driveshaft will turn smoothly. In order for this cancellation to take place the dshaft must be "timed" or phased. When the end yokes of a dshaft are in the same plane the dshaft is "phased" properly. This is true for a one piece or a multi-piece driveline. Having stated the above, the Riviera dshaft is an exception. I have never seen another dshaft intentionally "out of time" but that is what the engineers intended. The extremely unusual 67 and 1/2 degree phasing of the Riviera driveshaft is illustrated in the factory shop manual. A Constant velocity or "CV" joint is basically 2 ujoints in unison which self cancel the vibration occurence referenced above. A CV joint is generally employed when a driveline is designed to go thru extreme variations in operating angle. A "half shaft" in a front wheel drive application is an example of this that most people are familiar with. I believe that driveline vibration was an on-going gremlin for the engineers who developed the first gen cars as evidenced by the addition of a second CV joint to the driveline in the `64 and `65 cars. I dont know why the engineers chose the phasing they did for the Riv. It could have simply been a matter of field testing and achieving the best compromise possible. The physics behind the unorthodox phasing is beyond my pay grade! Their have been many hands on your Riv and substantial modifications so it`s hard to offer advice via the internet. But I`ll offer a tool I have used when chasing driveline vibrations in the first gen cars. I have installed air shocks in the rear and varied the ride height of the car to note the effect of the change in driveline angle which a change in ride height prompts. Keep in mind when the height of the body/frame is changed the angle that the 2 joints in the rear half of the dshaft operate through also changes. This might at least narrow down your problem between the front and rear halves...and you can leave the air shocks in place in case you load up the trunk with a couple of spare Nailheads! The '63 DynaFlow shaft from the factory is supposed to be approx. 37 1/2* out of phase That's why the joints on the front & rear shafts DO NOT line up. IF you try to line them up you will have a vibration. The '64/'65 &'66 shafts all have two CV (constant velocity) joints. These shafts from the factory were 67 1/2* out of phase. Designed that way. One of the MANY mistakes made/taken by most driveshaft re-builders. It happens all the time. They call & tell their customer the shaft is out of phase & if you try to tell them ANYTHING diff. you don't know what your talking about. I take that you need to use the shorter shaft because the 700R4 is longer then the DynaFlow & you ALSO have an adapter behind the "Nail" that ALSO adds to the length. SO, bottom line is too phase it correctly to mimic the original '63 shaft & you should then be good to go. I think at this point, now viewing your pictures, I`d vary the phasing of the front and rear shafts and observe the results. Start at the correct factory phasing, same as the `65 shaft assuming that it has not been "corrected" and see what happens. At some point you could also use the `65 rear half and take advantage of the CV joints. To do so, you would need to change the diff yoke over to the `64-`65 type...very do-able. I cant say I would beat up on the shops for this mistake...I`ve seen sooo many heavy duty multi-piece driveshafts over the years and they are all phased with the yokes lined up. If I hadnt worked on Rivs all these years I would probably make the same mistake, that is, assume someone got in there that didnt know what they were doing and screwed up the driveline timing. Thank you both for your input. Thank you for taking your time to write this for me. It's greatly appreciated. No one seems to have know about this. You could see that the shaft I'm running is phased straight up. I need to find myself a drive line guy here in south west FL. that understands this situation. Again thank you ALL for taking the time to be so helpful. A couple of last thoughts. I ask the driveshaft guy down here about adding the 2 CV joints like the 65 has. As you can see mine has none nor did the original driveshaft on the right of the picture. Anyway he didn't like the idea. He said it would be much better to correct the problem without them. But can it be cured without them? Any thoughts? Also without the CV joints would you try to set it up as a 63 or a 65 first 63 1/2 or 67 1/2? Or may it end up with some variation between the two points? Any thoughts so I'm not chasing my tail? Oh by the way does anyone know the pinion angle of a 63? I would like to set that if possible before I start chasing the phasing so I'm not running in circles. Can you/do you get involved with doing any repairs yourself??? Goggle search pinion angle. There is nothing that I know of that's mentioned in any Buick chassis manuals. To check it the car needs to be on a flat surface like a drive on lift, but you need to check the angle of the lift with the car on it then take your readings. The '63 was out of phase by 37 1/2*, NOT 63 1/2. The '65 has two CV joints because the engineers figured it would be needed. You don't need to bring the shaft to a shop. You can do it yourself very easily. Do you have a shop manual??? It explains it rather clearly what needs to be done. Any questions I'm here. Or send me a PM & we can talk. Your driveline guy probably doesnt want to use the CV joints because they can be a pain to service and you already have a known rebuilt dshaft with new joints. It is possible for you to achieve acceptable results without them, they are a "finer tune" than may be necessary. Also, to use the `65 shaft you would have to change the diff yoke. You definitely need to obtain a shop manual if you do not have one.